ANN ARBOR, Mich., February 26, 2018 - Mechanical Simulation Corporation is pleased to introduce the results of a four-year project in the 2018 releases of CarSim and TruckSim: a modular design that allows users to simulate vehicle configurations that were not originally anticipated by the developers. According to Dr. Michael Sayers, CEO and Chief Technology Officer, “Given the high fidelity of our CarSim and TruckSim 3D multibody vehicle models, our simulation tools have always run very fast on the computer. This is because we have used a proprietary symbolic program to apply physics that automatically derive equations optimized for a specific vehicle. The equations for a four-wheeled vehicle with a front independent suspension and a solid-axle rear suspension are fundamentally different than the equations for a vehicle with independent front and rear suspensions, so we have simply used the computer to generate separate math model programs optimized for each configuration.” That technology has always allowed the CarSim and TruckSim simulation tools to run with state-of-the-art speed, allowing real-time simulation for almost 20 years. 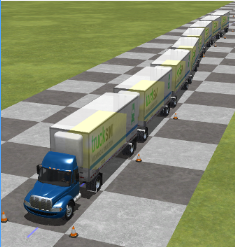 On the other hand, existing modular 3D multibody dynamic programs give more modeling options, but they are inefficient compared to the optimized custom equations that have been used in CarSim and TruckSim; most commercial 3D multibody programs take 10 to 50 times longer to run than CarSim and TruckSim when used for comparable vehicle models. Over the past four years, Sayers and others at Mechanical Simulation have devised a modular software design in which computer-generated equations for vehicle parts are combined within a single computer program as needed to simulate all vehicle configurations that were supported in past versions. David Hall, Senior Development Engineer, adds, “Not only can the new 2018.0 releases of CarSim and TruckSim handle all vehicle configurations that we supported in past versions, the new tools allow users to simulate new configurations that were never feasible to consider.” In the case of TruckSim, Hall has explored the range of possibilities by creating example vehicles that have previously fallen outside the scope of basic simulation tools. These include a vehicle with 9 axles (5 powered) used in construction, a combination vehicle with 47 axles: a 5 axle tractor with 3 14 axle semitrailers, and a “road train” vehicle with 15 dollies and semitrailers. About Mechanical Simulation Corporation: Mechanical Simulation Corporation is a technology leader in the development and distribution of advanced software used to simulate vehicle performance under a wide variety of conditions. The company was established in 1996, and from its Ann Arbor, Mich., headquarters provides car, truck and motorcycle simulation packages, training and ongoing support to more than 90 OEMs and Tier 1 suppliers, and over 160 universities and government research groups worldwide. For more information, please visit www.carsim.com. 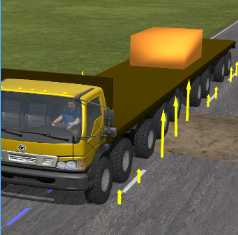 TruckSim users can now build very large tractor-trailer configuration.